University endowments have been going through a rocky road since the 2008 financial crisis. As the economy recovered, average annual return of U.S. endowments saw a handsome uptick in recent years, spiking at 15.5 percent in 2014, according to a January study by the National Association of College and University Business Officers. Then in 2015, the upward trend stalled abruptly and plummeted to 2.4 percent, mainly hurt by the turmoil in commodity prices and natural resources, the study says. However, as long-term investors, endowments often look beyond one-year data to evaluate true performance. 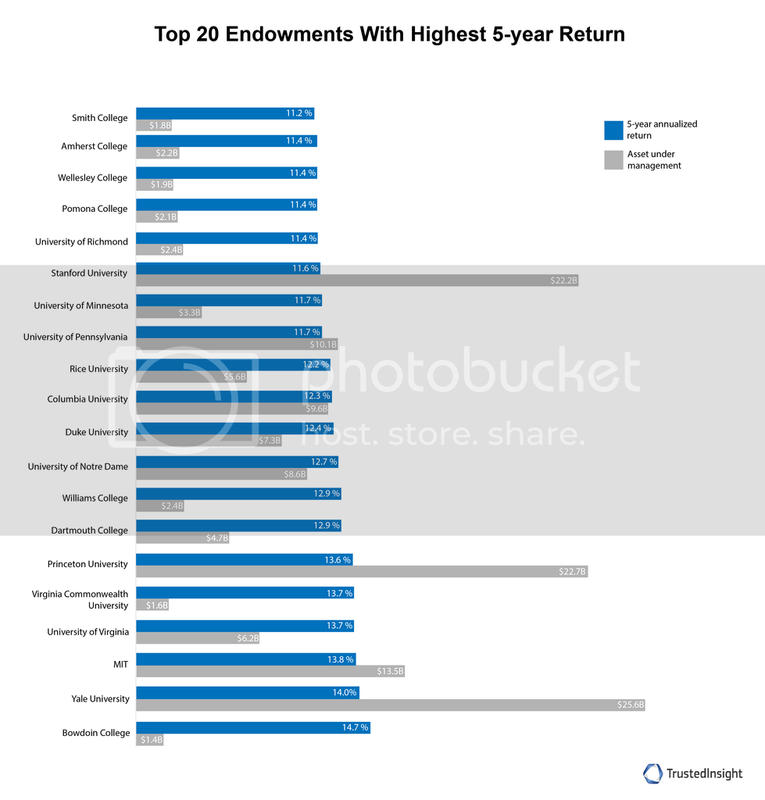 In order to capture a post-recession look at these endowments’ investments, Trusted Insight analyzed more than 900 U.S. school endowments and foundations that manage more than $1 billion and ranked 20 with the highest five-year annualized return. While bigger endowments historically yield higher returns because of economy of scale and the ability to diversify, the rankings may surprise you. *Approximate annualized returns calculated using previous FY 2011 to 2015 financial statements. Note: This article was updated on April 15 to correct the 5-year annualized return for Princeton University Investment Management Company and the Yale University Investment Office. Princeton's 5-year annualized return is 13.6%, not 11.5%. Yale's 5-year annualized return is 14%, not 12.4%.